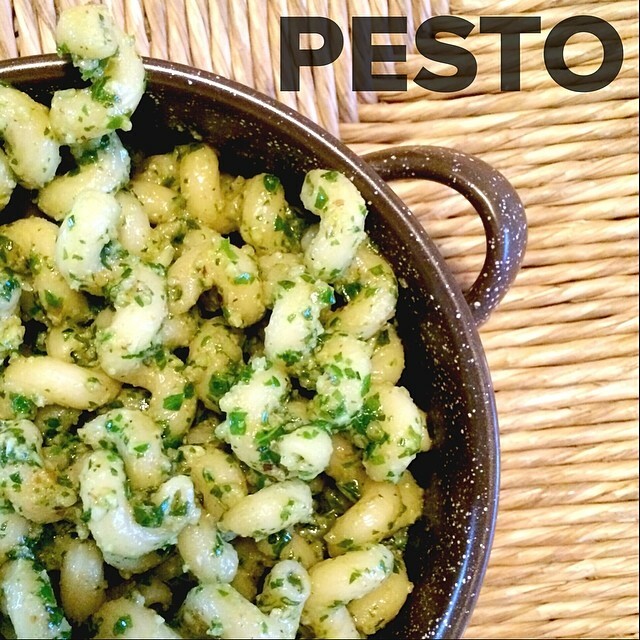 I tend to only make pesto in the summertime – otherwise there is no way I would be willing to spend the money on 2 cups of basil, know what I mean? This year I have 3 huge basil plants thriving in my garden. Each week I pick off a couple of cups of basil. Because I don’t want it to go bad I have to come up with something to use all of it. I’ve made vegan pesto lasagna and stuffed shells from The Accidental Vegan cookbook a few times, and they were both great, but I thought I’d try just a regular pesto. This is what I came up with, and it’s really good! Sea Salt & Black Pepper to taste. Combine everything but the oil, sea salt, and pepper in a food processor. Pulse until it is fairly smooth. I don’t like mine completely puréed, but it’s up to you. Stir in your oil and add your spices. Serve over cooked pasta, use as a spread for bread, use as a condiment for sandwiches. Get creative, it’s delicious! Okay… so it’s not always mac and cheese, it’s more like spirals, shells, penne, farfalle, bowtie, whatever you want – and cheese… but you get the idea right? 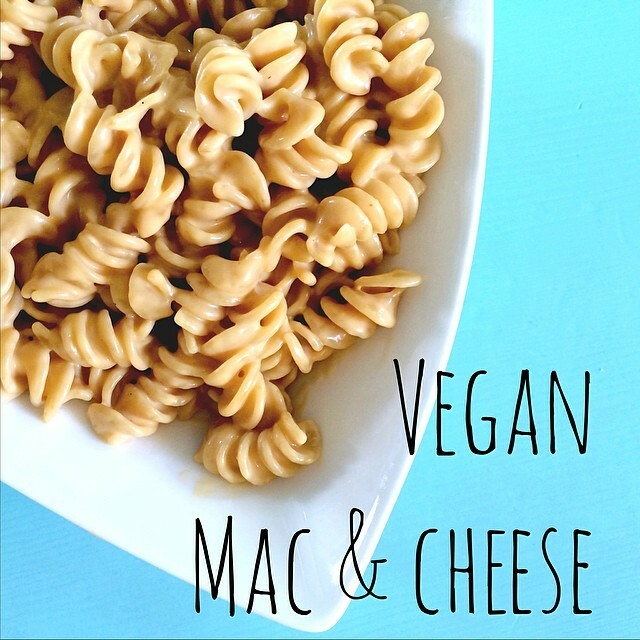 My husband actually created Vegan Machine’s original mac & cheese recipe several years ago, but we have since simplified and improved. Basically, we have the cheesy vegan sauce down to a science. We use this general recipe, or some form of the recipe, in so many different ways. We make nachos, alfredo, queso, cheesy cornflake potatoes (Utah folk call ’em Funeral Potatoes), cheese sauce for veggies, and much more. 1. Boil water, cook pasta to your liking. I do mine for exactly 10 minutes every time. Strain and set aside. 2. In same pot on medium heat, add your prepared broth, sour cream, sriracha, and pepper. Whisk together completely. 3. Add Daiya Cheddar Shreds. Turn your heat up a bit and continuously whisk until it is all melted. This may take a few minutes. 4. Once mixed, turn your heat back down to medium. Add you strained noodles and stir until even heated. 1. I super strongly advise that you use the exact brands I have listed in the recipe, otherwise I make zero guarantees. The broth and cheese are the most important. You could get away with using Follow Your Heart sour cream or even Tofutti’s Sour Supreme, but I don’t recommend it. 2. Don’t overcook your pasta. Why? That’s just gross. 3. It’s not great warmed up. It kind of tastes like the cheap Kraft boxed mac & cheese used to when you used to warm it up before you gave up dairy. Remember those days? Not great right? 4. Daiya needs higher heat to melt. Watch it closely. Let it bubble up, but don’t scorch or burn. 5. The sriracha shouldn’t make it spicy (unless you like it that way, then add more). I give my little girl this recipe with the sriracha with no worries about it being too hot. My husband also hates spicy stuff and doesn’t think this is spicy. But, if you don’t have sriracha, you can leave it out. But really… just get some, it’s the best. 6. If you want a tiny bit healthier, lower in calories, and cheaper version – you can just leave the sour cream out. It won’t be super creamy, but I make it this way sometimes too, it’s still pretty good. 7. The broth is your salt. If you use a different kind you may need to add in some extra.